A hundred and seven (107) years have passed since Rohto Pharmaceutical developed its first eye drop. We continued to support the joy of seeing through considering thoroughly the important sensory organ called the eyes. Just like how the founder Yasutami Yamada supported the establishment of a blind school, we are also believing to support the idea that there are values in the things that we cannot see. Such belief has allowed us to continue supporting the nursing of guide dogs and blind soccer, a sport for the blind. The convenience of the present day allows us to see through almost everything. However, we wonder if the truly important things that we had lost sight of do exist in the world of blindness. Rather than one-way supporting the visual impairment, there should be many things that we can learn instead by interacting with such world. Rohto Pharmaceutical's new vision of continuing to support the eyes lies in a society where both worlds coexist and help one another. Ever since founder Yasutami Yamada established the first blind school in Nara (present Nara Prefecture Blind School), Rohto Pharmaceutical has continued to support those with visual impairment. At the present, Rohto provides various types of support including the Japan Blind Soccer Association and Japan Eye Mate Association that promotes widespread of guide dogs. 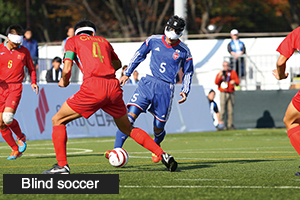 The speed of the ball that races back and forth the wide soccer field is no different from ordinary soccer. The only difference is that the ball is not chased by sight, but sound. The overwhelming speed and teamwork will surely exceed one's imagination. Eye Mate refers to dogs that qualify to be one's eyes by passing rigorous amount of walking tests. 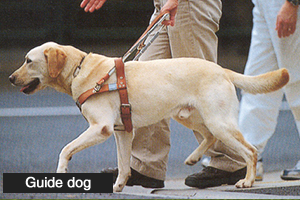 They go on to be guide dogs by a miraculous matching with their partners. Rohto provides support so that people can walk happily with their newly encountered Eye Mate. Such support is provided by the Karugamo Fund launched in 2003. At 390 yen per donation (39 is pronounced much like thank you in Japanese, hence the amount), funds raised by employees and from the company are used in various activities each year including welfare and environment. Through such support, we will continue to aim for a new world that cherishes, imagines and learns from the world where vision does not matter.